« Lamb Stew, Happy St. Patrick’s Day 2016! Around 3 hours, perhaps a bit longer drive off route from Arizona, twisting along the flat dusty roads of desert and continuous arrays of cactus, sets a small Mexican town, “Puerto Penasco.” A small fishing village, Puerto Penasco was always more commonly nicknamed by Arizonans as ‘Rocky Point.’ Located on the Sea of Cortes, soft sandy beaches frame vast calm waters under brilliantly bright sunny skies, which over time then further lured vacationers to some of its developing vacation type amenities. Years back though, Rocky Point was a fun ride from the Phoenix area, only a little longer than a day trip to the Grand Canyon in the opposite direction, really. The ride south was a bit hotter though, stirring within an exhilarating feeling of freedom, the kind one feels speeding down an all but empty highway with windows open, mountains as your surround, hot wind blowing like fury, and the radio blasting, all while singing top country western favorites that deeper into the desert areas eventually faded in and out to the ‘muy rapido’ sounds of Mexican Mariachi. Given very limited motel accommodations at the time, one of the real goals of the adventure besides a day or two on the beach was caught in one word, Shrimp. Make that two words, Giant Shrimp. Wait. Make that three words, Cheap Giant Shrimp. I mean fresh out of the nets, Giant Shrimp for really, really cheap. Cheap enough to snag a cooler full to host a big ole’ barbecue upon return home for friends, and maybe theirs too, for practically next to nothing. Now at the time, Puerto Penasco, Rocky Point, hosted as few restaurants as there were accommodations, and among those, the feature food was singly sourced right off the big ship that had a big giant crane jutting into what appeared as the vast beyond, Fresh Giant Shrimp. There was shrimp for every single meal, its potential proportions kind of like the movie “Defending Your Life” where in Judgment City you can eat as much as you like with the pounds of shrimp served table-side, only in this case, lots of giant shrimp were encased within every meal, breakfast, lunch, and dinner. Upon departing my last visit to the small Mexican fishing village, Puerto Penasco, Rocky Point, was a lunch of Shrimp Salad on a bed of lettuce. Lots of giant shrimp, chopped into bite sized pieces, tossed with chopped hot peppers, probably jalapenos, red onion, cilantro, brightly colored peppers. 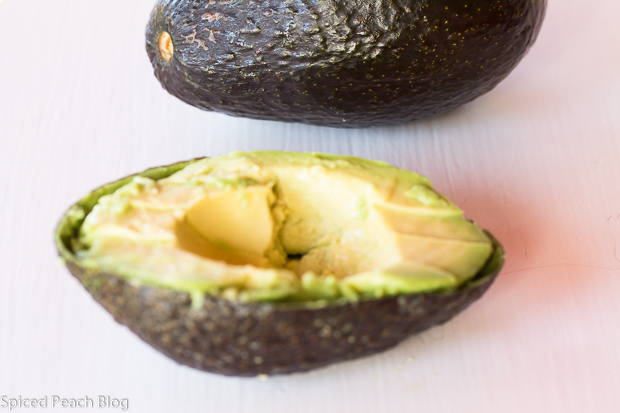 A creamy base, I feel as if avocado may also have been folded into it, cubed, perhaps. I cannot recall. It was a simple salad really, but colorful and fresh, with some similarity of combined ingredients that continue to inspire many of my own dishes today, even in a hoagie, a Seafood Salad Hoagie. Let salad chill covered with plastic wrap in the refrigerator for at least two hours to fully infuse and develop flavors before serving. Preheat oven to 350 degrees. Place shrimp onto a baking sheet and roast in oven around 5 minutes or a bit longer until pink and just firm. Transfer shrimp to a cutting board, once cooled, chop shrimp into small bite sized pieces. 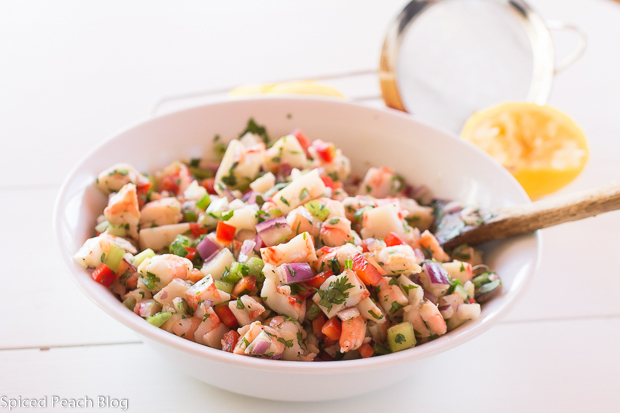 In a large glass bowl mix together the imitation crabmeat, red pepper, red onion, jalapeno, and celery. Stir in the cooled chopped shrimp pieces, pour in the lemon juice, stir, then fold in the mayonnaise. Sprinkle in salt and pepper, taste, adjust salt and/or mayonnaise a bit more to taste, if desired. Scrape in the cilantro, stir throughout. Cover salad with plastic wrap and refrigerate for preferably 2 hours for flavors to fully develop before serving. Remove excess puffy bread part from the inside of the hoagie roll. Line roll fitted with red leaf lettuce, tomatoes, and sliced avocado. Stir seafood salad together well, check again for seasoning, adjust to taste. Spoon a generous quarter amount of salad onto each roll, serve straight away. 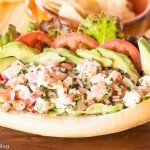 This entry was posted in Fish, Sandwiches and tagged Seafood Salad, Seafood Salad Hoagie. Bookmark the permalink. Post a comment or leave a trackback: Trackback URL. 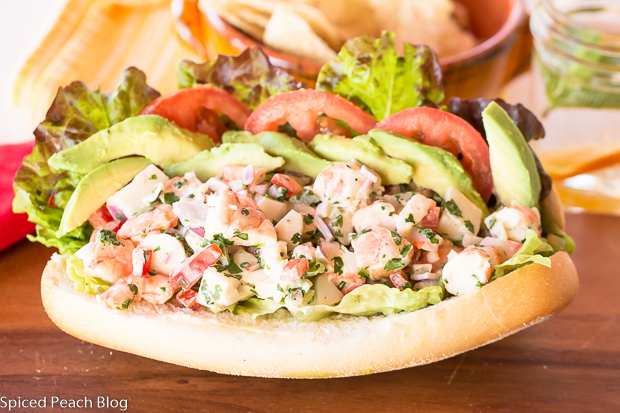 When I was growing up, we used to eat quite a bit of seafood salad, similar to your recipe. I like the avocado addition. Avocado makes many things better. Thanks for sharing, Peggy! Hi Kelly, Thanks so much! Hope you had a Happy Easter. I do love seafood salad and especially the deli version, which I think you may be talking about, or similar anyway. I do love the avocado addition, and a little of jalapeno for a bite doesn’t hurt either. See you soon! Yum. This would be right up my alley since I have stopped eating red meat. Now mostly seafoods and veggies for me. Phil recently posted…Running Into A Lifestyle Change Head-On With No Fear. Hi Phil, Great to see you! I read your post the other night on your lifestyle change and am impressed with your progress and determination. Best wishes on your continued success. It seems you were ready for a change. 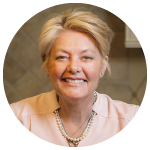 It has been hectic readying for Easter and I am off to Vegas to see my sister a few days before heading to the International Association of Culinary Professionals Conference in Los Angeles. Congratulations and Best Wishes. See you soon.